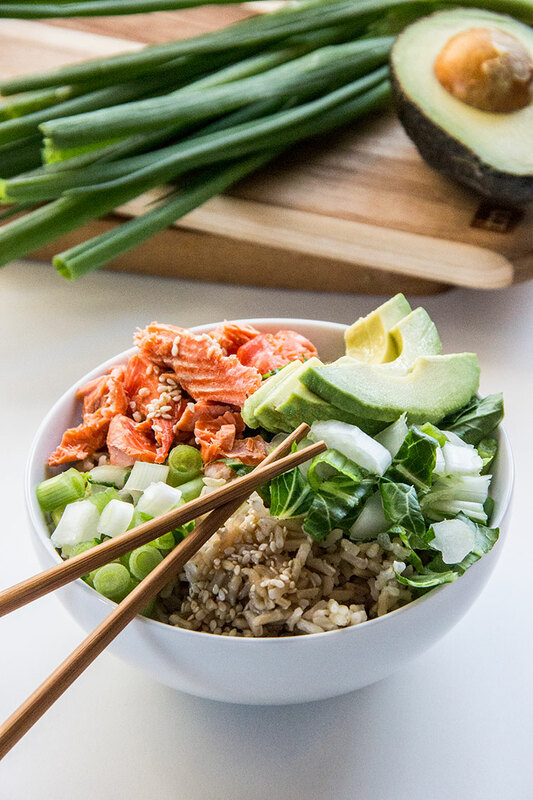 Salmon Avocado Bowls filled with tender flaky salmon, creamy avocado, crisp bok choy, green onion, and the most flavorful, easy-to-make Sesame-Ginger sauce. Long before our beagle Calvin and long before our baby Trevor joined our family, Chris and I ate out almost every Friday night. Most Fridays, tired from a long week of work and bumper-to-bumper traffic on the commute home, we’d stop at a Japanese restaurant just a couple of minutes from home. Small, decorated with live plants and piping in serene instrumental music, the restaurant had a calming effect. It was the perfect spot for a leisurely meal, which we had time for in those days! All of the food was delicious, but we loved the salmon-avocado maki especially. Savory fresh salmon, crisp seaweed, creamy avocado. Complemented with nutty sesame seeds and a touch of pickled ginger and soy sauce. It was just the perfect bite of food. These Sesame-Ginger Salmon Avocado Bowls are meant to mimic that fresh, crisp-yet-rich-and-creamy, incredible combo of flavors. 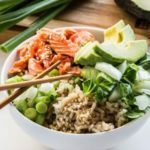 They feature flaky salmon and rich avocado, of course, but also bok choy and green onion for lots of fresh, crisp, added flavor. And it’s all covered with a homemade sesame-ginger dressing that’s salty-sweet, with sesame oil, soy sauce and a bit of honey. To make these bowls, I first prepare the salmon by roasting it in the oven with bok choy and green onions. Bok choy is very mild in flavor with a delicious crunch. It’s the perfect, fresh and crisp complement to the rich avocado and tender salmon. If you can’t find bok choy, a head of cabbage is the next best substitute. 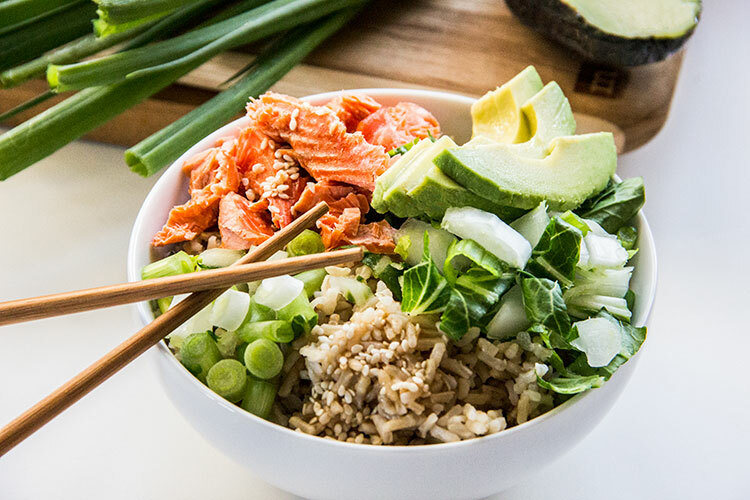 To make these Salmon Avocado bowls complete, I love to serve this dish over rice. The rice is key, because it soaks in all of the flavorful sesame-ginger dressing. Place the salmon on a large sheet of aluminum foil or parchment. Top the salmon with the bok choy and green onions. Roll the edges of the foil/parchment to create a sealed packet. Place packet on a large baking sheet. Cook until veggies are softened and salmon is cooked through, about 20 minutes. Meanwhile, as salmon cooks, prepare the sesame-ginger dressing. In a large bowl, add the sesame oil, soy sauce, rice vinegar, honey, sesame seeds, and ground ginger. Whisk until ingredients are well combined. Transfer the cooked fish and veggies to serving bowls. 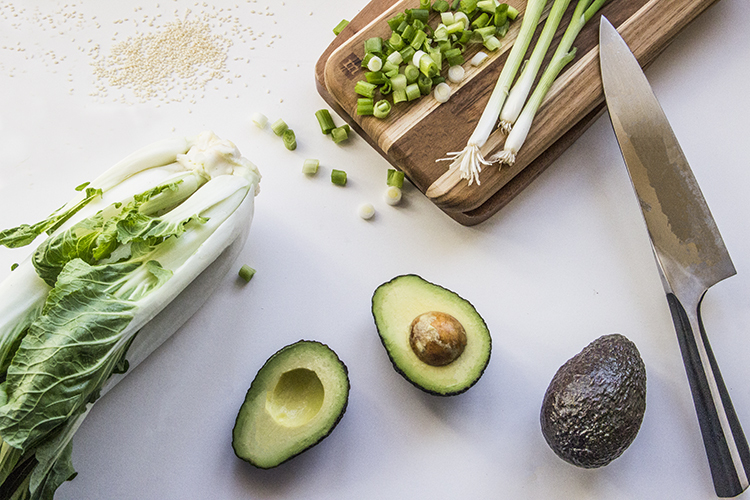 Top with the sesame-ginger dressing and diced avocado.